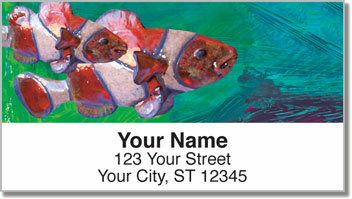 How could any artist resist a subject as brilliantly beautiful as the Clownfish? With their bright colors and tell-tale white stripes, these finned friends are one of the most recognizable tropical fish in the sea! Clownfish get their name from being quite lively, however their antics are anything but foolish. They are very territorial, and will aggressively protect their home among the Sea Anemone. 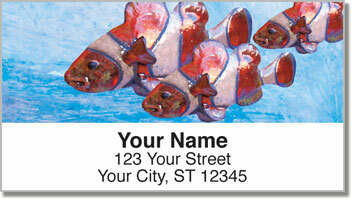 Painted Clownfish Personal Checks from CheckAdvantage are an eye-catching choice for anyone who has their own aquarium or simply enjoys tropical fish and everything under the sea! Use these labels to cut back on the time it takes to prepare outgoing mail. 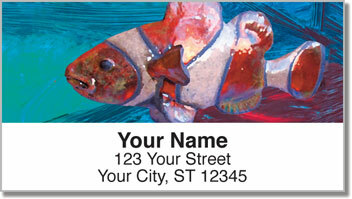 Instead of painstakingly printing your name and address, just peel and place. You'll love how easy it is! 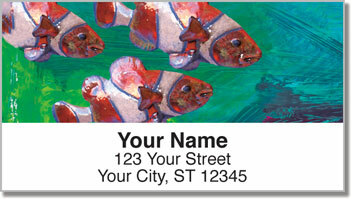 Get your own Painted Clownfish Address Labels now! Complete your order with matching checks!